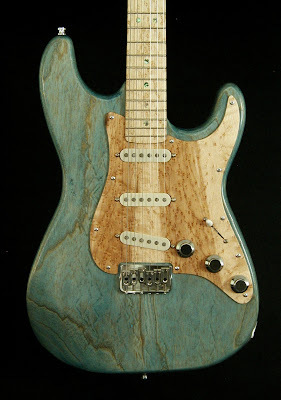 Mike Delaney of Atlanta, GA based Delaney Guitars is all about creative finish ideas! You absolutely must take some time to look around the Delaney website. I love the classy nature inspired vibe of the above featured model. 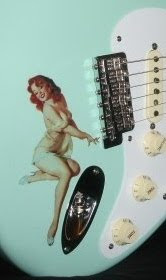 "We built this guitar for the great blues artist Tino Gonzales. We have been fans of Tino’s for many years and when he contacted us to build a guitar, we jumped at the chance. The “Angel” is a variation on a Strat with a swamp ash body tinted with our “Ocean Blue” aniline dye and topped with nitro-cellulose lacquer. We cut a custom birdseye maple pickguard for it and loaded it with Amalfitano SP pickups. The electronics package includes a master volume, master tone, and a blender which gives this guitar amazing tonal versatility. Hardare includes a Hipshot hardtail bridge, a five-way switch, Schaller strap-locks, and chrome knobs. We mounted Hipshot locking tuners on it and Ernie Ball regular Slinky strings. On the back, we engraved a very subtle pair of angel wings into the body. We shipped it to Tino in Germany where he now resides and we’re told he’s already recording with it and it will be featured on his new CD. Another “Angel” will be in the works very soon in blood red. Stay tuned!"